EquestrianCoach is privileged to present the teaching and training methods of Bertalan de Nemethy. During his 25 year post as coach, the legendary equestrian led the United States Equestrian Team to international acclaim in 6 Olympics, 5 Pan American Games, 4 World Championships, and countless international competitions. We start this series with a longe line session designed to establish, maintain and refresh the rider’s proper position in general and to develop a solid seat in particular. He even used these techniques on his team riders right up to and during the Olympic Games. Exercises on the longe line, with a calm, willing horse, allow concentration to be placed on building the rider’s strength and correcting weaknesses. Equine activities can be hazardous and may subject participants to injury. 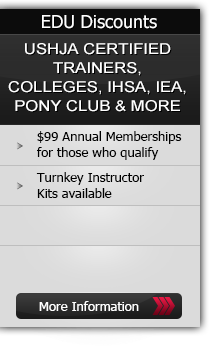 Neither Equestrian Coach, LLC nor Bertalan de Nemethy assume liability for your activities. This program provides general instructions and techniques that may not be suitable for everyone. No warranty is given regarding suitability of these instructions to the viewer.